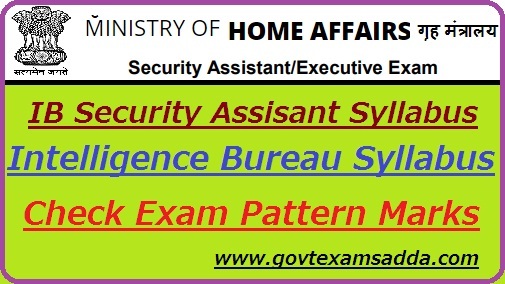 Intelligence Bureau Security Assistant Syllabus:- The MHA Intelligence Bureau Department released 1054 vacancy for Security Assistant. Now the board has been upload IB Intelligence Bureau Security Assistant Syllabus 2018. Here, Our team has been given IB Security Assistant Syllabus & Exam Pattern 2018-19. So you can check below the complete details. The IB Department uploaded the Exam Syllabus of Security Assistant. The Intelligence Bureau currently release the official advertisement for the recruitment of 1054 Security Asst. vacancy. Contenders who have filled the IB Security Assistant Online Form 2018 can now access the IB Intelligence Bureau Security Assistant Syllabus 2018 PDF from here. The IB will elect the aspirants on the basis of the Written Examination conduct soon by the board. Applicants must need to begin the exam study through officially released the IB Security Executive syllabus 2018 PDF. Contenders can access the IB Security Assistant Exam Syllabus via the link given on this page. Along the written exam syllabus, We have given the Security Assistant Exam Pattern also. The Examination authority now upload the Intelligence Bureau Security Assistant Syllabus PDF. Contenders who have submit their form they are access the IB Security Asst. Syllabus and start their exam preparation to secure selection. As per the news, IB Security Assistant 2018 Syllabus official release Soon. So stay aware and make continue exam preparation. Security Assistant exam consist various subject in Which Mainly contains General Awareness, Quantitative Aptitude, Logical/ Analytical Ability & English Language etc. Applicant has to appear in Tier-I at one of the test centres. There will be negative marking of ¼ mark for each wrong answer. No marks would be awarded for an un-attempted question. may also remain restricted due to said cut-off in Tier-I. Candidates appearing in Tier-II exam would be provisionally admitted in Tier-III exam, i.e. interview/ personality test. combined performance in Tier-I & Tier-III exam. The cut-off in Tier-II is same for candidates of all categories. There is no cut-off for Tier-III exam. The final selection would be further subject to successful completion of Character & Antecedent verification followed by medical examination, etc. Security Asst. Subjects and topics of the examination are enclosed in IB Security Executive Syllabus 2018. Candidates must refer Intelligence Bureau Syllabus & Test Pattern to prepare for the written test. Paper II Will be Descriptive Type Test on English Language. Questions will be from English: Essay, Précis writing, Comprehension and Business/Office Correspondence. This part will be designed to Check English Writing Skill & Analytical Ability. Candidates who are willing to prepare for the written exam and searching for the best ideas can see here. We are giving the outstanding Preparation Tips for IB Security Assistant Exam for the guidance of applicants. Aspirants are suggested to refer only official IB Security Assistant 2018 Exam Pattern, because the Intelligence Bureau Department prepare the written exam paper from the IB Intelligence Bureau Security Assistant Syllabus 2018 only. If you have any query than comment us.